Tucker makes some of my very favorite blouses. Not only are they really comfortable, but I always adore the print and color combinations. The best part, though, is that they’re super versatile. 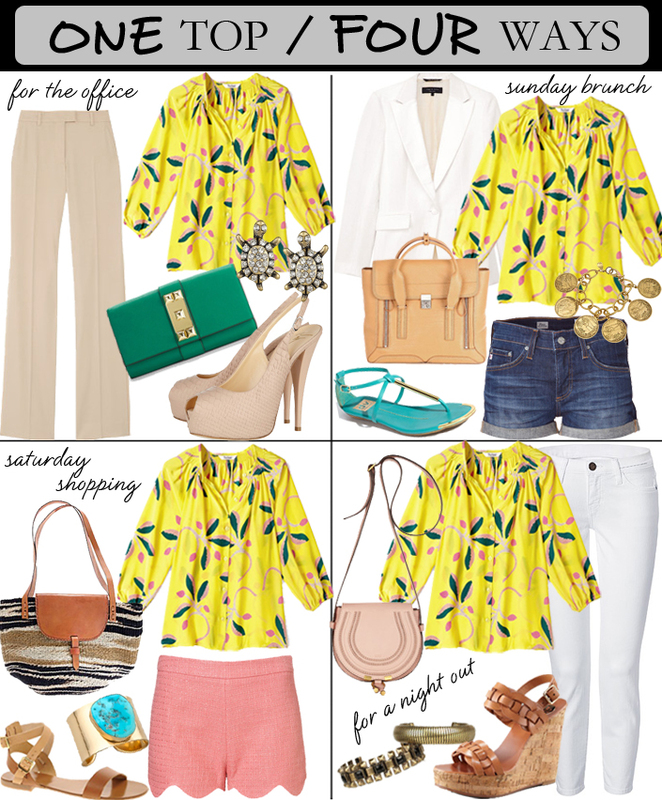 One blouse will take you lots of places, giving you a bang for your buck. I’ve been eyeing this bright yellow one (I told you I’ve really been this color lately! ), and I think I might have to add it to my shopping cart today. It’s the perfect spring/summer blouse, and I know I’ll wear it a million different times. What do you think? Great post love showing the versatility! That Tucker blouse is one of my absolute favorites. I love seeing it so many ways! I LOVE seeing this so many fabulous ways! I want it to appear in my closet ASAP. Love this! I'm a huge fan of tucker blouses. If you want a look alike for cheaper Old Navy makes some great ones as well. Its a beauty! I love all the ways you styled it, so many options! Tucker is one of my absolute favorites! Fun! I love Tucker and it's always great to see different ways to style one piece. All of these looks are great! I feel like it would also look great with jeans going into fall! I LOVE Tucker blouses! The shape is so interesting and goes well with so many different things (as you show beautifully). I'm especially fond of the Sunday Brunch and Night Out outfits. Lovely!! Tucker really does create the most beautiful blouses. Great outfits! Hello! I'm a new Charlotte, NC based blogger http://www.thequeencitstyle.com AND new rewardStyle member and found you on their month of March Top 10 list. I just wanted to say hello, and I love this ensemble collection you put together! I look forward to receiving your emails for inspiration!